I have owned and worn these boots as my primary hiking and multi-day backpacking boots for more than 8 years. I am a forestry field technician as well as an everyday avid hiker, and have managed to make a few multi-day backpacking trips with them per year (I would have made more, but with a young family it is hard to find the time!). I have used them in everything from low and wet terrain, to rolling hardwood ridges with steep valleys, to the steep and rugged Fundy Coast, to the rugged mountains of New Brunswick, Quebec, Maine, Cape Breton, and Newfoundland. I work in the field as a forestry technician. These boots have been in the woods on a daily basis since I have owned them, excluding the coldest days of winter (and when I am on my skis!). I have also used them as a work boot, primarily spring tree planting. In short, I have put these boots to the test—the brutal test—and they have more than passed! 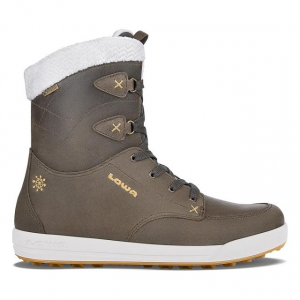 When I first bought them I hesitated, really wanting a heavier boot, but not wanting to spend the extra cash. I am only now — 8 years later — finding that the soles are nearing the end of their life, and am thinking of replacing them (currently looking at both the Scarpa Kinesis GTX and the Scarpa Wrangell GTX). My only complaint is not really fair; I always wished I had bought a heavier pair of boots and am considering this choice again now. That being said, with more than 20 years field work experience and hiking/backpacking, these are by far the best pair of boots I have ever owned. I personally have always found the Scarpa last to fit me very well. I have a low-volume foot, narrow heels/ankles, and the ball of my foot is relatively broad (relative to how narrow my heels are). Often boots that fit me in the heel/ankle are too tight and narrow across the ball of my foot. Conversely, often boots that fit the ball of my foot are too broad at the heel and are then murder on my heels/ankles. However, I have found, to date, that an aftermarket insole has perfected the fit (due to my low-volume foot). Nice review, Gareth. Thanks for letting us know how well these boots have performed for you these past 8 years. I have been wearing these Scarpa type boots for over nine years now. I am very hard on boots. Walmart type boots last 3 months. These boots last me three years wearing them every day in outdoors physical work. I wore these boots out. The soles were worn through (Vibram), the sides were coming apart, and yet they are still bone dry inside. Seven months ago I bought another pair. These boots just keep on preforming. Best boots I have ever owned. I am on my third pair now. I work with a Church Boy Scout group called Royal Rangers and we do over 30 outings a year. Just finished a 25-miler two weeks ago. Best boots ever. I don't have any cons on these boots. Love them. In the linework I do for the phone company these boots go the miles and are a pleasure to put on. I have a new pair on right now. Hey Mark! I work for Illinois District AG. Very familiar with Royal Rangers. Thanks for the review, Mark. Nice work getting the kids outside too! Love backpacking and Rangers and Scrapa boots. The price was over $240 at the time of purchase. Bought these for a 60 km hike on Northern Vancouver Island. Expensive but worth every single penny and more. Have since taken them across the world; they are extremely durable. Only after 2 seasons tree planting in northern BC has the rubber started to come off, never has anymore ever had such great planting boots that last so long. Amazing. Still great condition; keep my feet dry without fail even after 6 years. Ankle support is amazing. I have wider feet as well, and bunions, but the boot fits great. Will take these to the grave with me! Thank you, Scarpa! 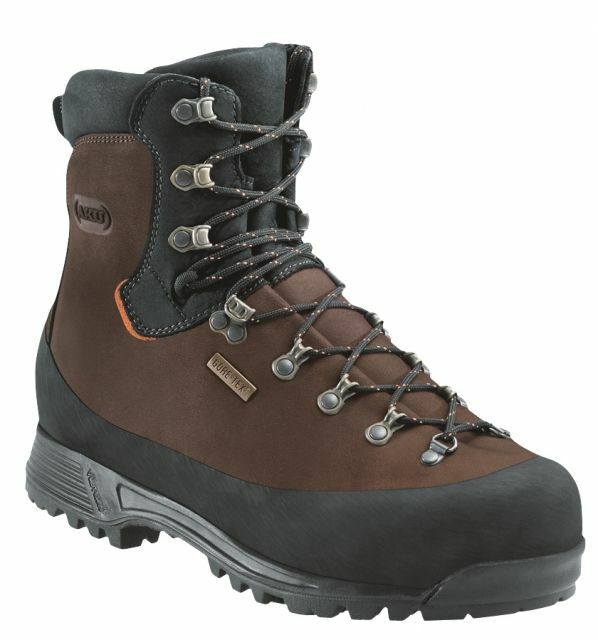 No frills three-season boot, very comfortable on rock. 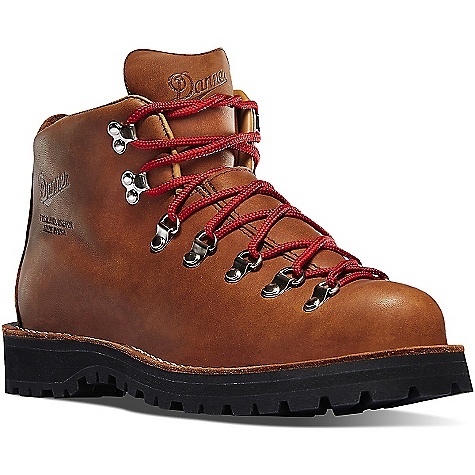 No frills three-season boot, very comfortable on rock. Works best with break-in time. Proven methods and materials of impressive performance and quality. All-leather design simply not as cool (temperature) as fabric. Included footbeds about as thick as a business card. Sole tread showing initial visible wear after about 100 miles with a pack. I have had minor heel blisters along my achilles with these boots but I am willing to write these off to break-in time. My latest hikes using a heavyweight sock over a wick sock have been blister-free. I have Birkenstock 3/4 length orthotics under the footbeds. Scarpa has served me well for about 10 years now with approach shoes. My feet are medium width. Width is perfect for me in a 46 medium from them. Wide sizes I cannot say. Ankle support is generous. The boots felt wooden at first but now feel like heavy glove leather molded over my foot. Underfoot pebbles, roots, and pointy precipices are not felt. The sole could be a shade stiffer for me. Steep sections of trail have left little eyelet imprints in the leather from the boot bending. For the other 96% of my hiking sole stiffness is on the money. Scarpa approach shoes are stiffer than most this way. I feel stiffness takes a load off the balls of my feet. Sole tread pattern looks like its ancestors were Montagnabloc. It has more void area than that classic design. The lugs are deep. The tread compound is sticky on hardpack dirt and just gets better on rock. No guarantees in the rain but these boots give confidence in general. Hike all day on snow and the leather, despite its advanced treatment, will leak. It's a three-season boot. Creeks are a non-issue. The boot has a Gore Tex lining but you are in the business of wicking sweat up out of your boots through your socks and the system overloads the way the tide comes in. That's the nature of leather—fine in alpine habitats. Hardware is all metal. Tying laces off for a custom fit would be easy. No need in my case. The noteworthy feature to me is the traditional design and materials motif benefiting from refinements in these familiar technologies. The upper has the characteristic Scarpa greek sandal swath of roughout leather stitched over the main smooth texture leather. It's like they're showing off how they can cut and stitch. The sole assembly looks right off a Scarpa Attack from 1991 but the innards are a laminate of modern materials to get that nice ride. 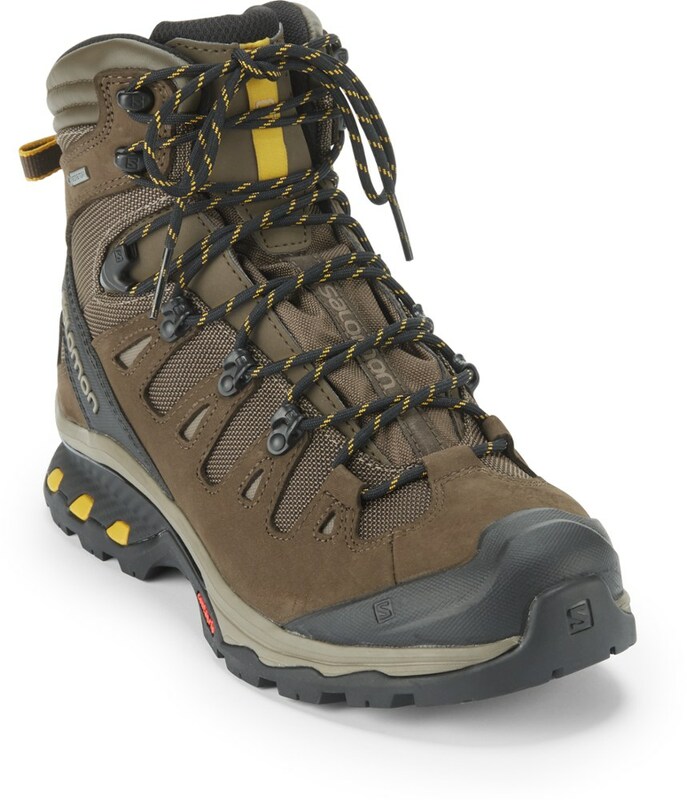 I test these boots on a seven mile trail that climbs and descends 2000 ft. with a 25-30 pound pack, closing in on 20 times. One or two small lugs on the sole are losing material. It is not as resistant to scratching as the traditional Montagnabloc. But I have no reason to fear a major failure in the field. I was stoked when i scored these at Sport Chalet for $150. i trusted the name, the construction, the custy reviews i read. however, after a few weeks of attempted break-in i gave up and returned them due to the gnarliest heel blisters i've ever experienced, as well as a small blister on the top of each little toe. the soles were too stiff and didn't give going uphill. there was no flex in the ball of the foot area, so my heels would lift up and down with every step. it didn't take long for blisters to develop, maybe a couple of miles. HUGE blisters. nickel size. on the descent is when i got the little toe blisters. they felt great in the store and i bought the correct size. that lack of flex just devastated my heels though. i was bummed because they're such nice boots. the waterproofness was great as well. i exchanged them for the salomon quest 4D gtx 2 days ago. haven't had a chance to test those yet, but out of the box fit and comfort is 2nd to none. Used these boots out of the box for 16.1 miles without any blisters or any kind of feet discomfort on rough trails with lots of rocks and pebbles. On more than one occasion when running down the mountain these boots have prevented me from spraining an ankle even when i felt i was averting it when laces were kept tight. Waterproofing is excellent and has kept my feet dry under mountainous snowy conditions in Keystone, CO, walking for hours in the snow. Feet were not cold with a pair of mountaineering socks at -15F. Have also used these off trail on Mount San Jacinto under snowy conditions in mixed terrain and falling through snow without twisting my ankles. Surprisingly I did not feel my feet hot in Anza-Borrego desert state park with light hiking socks in April with the temperatures in the high 80's. With all the abuse there is no visible wear and tear on the boots except the dirt that they have accumulated. 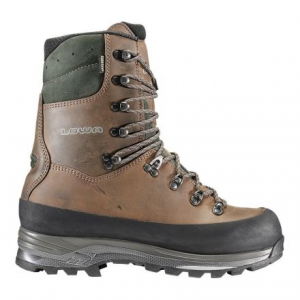 All in all a great versatile, tough backpacking boot or hiking off trail with great ankle support, excellent waterproofing and no need for break in. I took a 10 2/3 size pair of these with me on a 75 mile Philmont trek. Hiked thru streams to where the water almost went over the top, didn't even get wet. 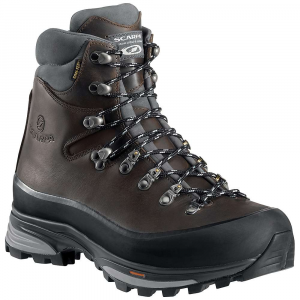 Hiked in hail, mud, rocks, rain, a bit of snow, this boot can handle it. I didn't slip once with these boots on. Incredible grip. I only got like 1 blister on each foot near the heel, because I didn't break them in long enough, but these boots are simply amazing, Scarpa build quality was excellent too. I rammed my toes into may rocks but I didn't even feel it. Good toe protection. Good Boot - Never thought I'd do this, but...bought this boot on a Friday for a Monday trip to Zion in Utah. Wore it all weekend, but when I strapped it on for the summit to Angels Landing, I was more than pleasantly surprised. Comfortable day one... two... three... and on. No rub, no nothing. Just a really comfortable boot. Scarpa is in my sights from now on. My favorite part… 11 2/3" size. Where else can you get that? 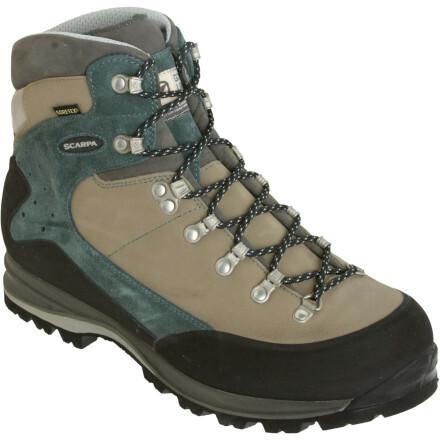 The Scarpa Barun GTX is not available from the stores we monitor. It was last seen June 5, 2014	at Massey's Outfitters.